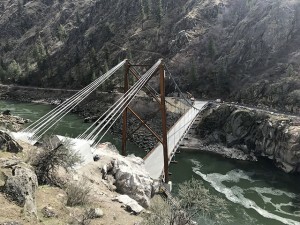 CM/GC project to replace a 300’+ span double tower cable-stayed, suspension, vehicular bridge over the Salmon river with a single tower cable-stayed, suspension bridge. 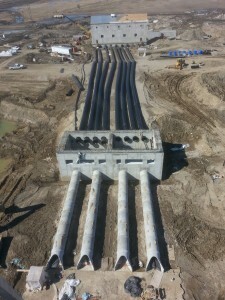 Construct the Donkey Creek Pump Station including procurement and installation of canned vertical turbine pumps, surge suppression vessels, and connected piping. The project includes site grading, earthwork, yard piping, mechanical, electrical, and instrumentation/controls work. Install new downstream drains, modify the dam crest, extend the top of the impervious blanket zone, furnish and install two outlet gates, and construct a new spillway and stilling basin. 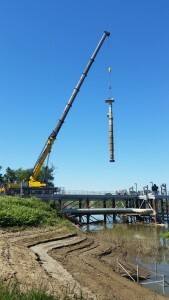 Replacement of a new river intake facility; consisting of a fish screen and a 150 CFS pumping plant on the Sacramento River. 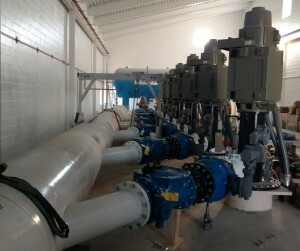 Components of the project include: demolition of the existing pumping plant and associated piping, pile supported metal structure with deck, access road from Garden Highway to plant and control enclosure, fish screens and cleaning system, Two (2) 350-hp vertical mixed flow irrigation pumps with adjustable frequency drives, three (3) welded steel pipelines between the pumps and an existing standpipe on the river side of the highway, control enclosure, and miscellaneous auxiliary equipment and site improvements. 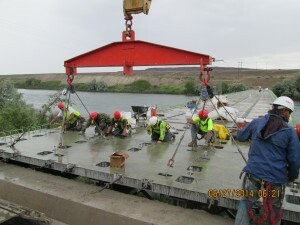 Rehabilitate a 565’ pre-stressed, pre-cast, concrete-panel bridge with 22 individual spans, concrete abutments and 21 steel bents. Construct new south gated spillway, new north and south roller-compacted concrete (RCC) dikes, new north and south side canal headworks, north and south RCC overflow spillways, and modify the existing north gated spillway. Demolish the existing overflow spillway and canal headworks; excavate foundations, spillway approach channel, and spillway outlet channel, install government-furnished radial gates, gate hoists, and associated equipment; furnish and install fencing, gates, railing, stairs, and gantry crane and associated rails. Raise the existing embankments along Devils Lake from elevation 1461.2 to 1468.2, construct a new interior drainage pump station/gatewell, and remove and demolish the existing pump station. 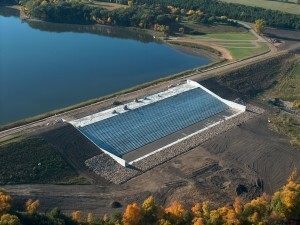 The new pump station work consists of structural headwall with 72” diameter inlet piping capable of discharging 280,000 GPM through eight 42” HDPE discharge lines connected to a gatewell structure 15’ below the lake surface constructed within an earthen cofferdam consisting of 650 ft of driven piles 300 feet into the lake. 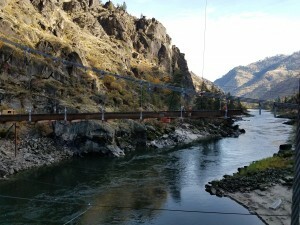 Other construction items include new primary and secondary power transformers and ductbank, elevated concrete deck with steel joist and deck for pump station electrical components and pumps, automated grease lubrication system for main pumps, 72” electrically actuated steel gates, 10-ton bridge crane, and overhead suspended rake system for solids collection. Excavate downstream side of dam for footing of spillway retaining walls and drain system. 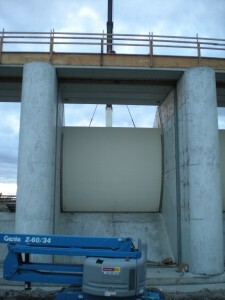 Construct a 500′ spillway of air entrained roller compacted concrete (AERCC) with cast-in-place spillway retaining walls. 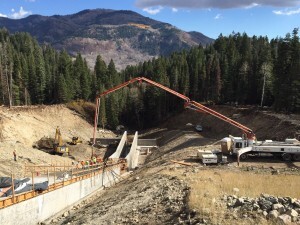 Construct new concrete water intake structure on Alpheus Creek and concrete discharge structure at the Blue Lakes Fish Farm, install 1840 foot (±) 60” HDPE pipeline (200 cfs), fittings, screens, safety devices and equipment, roads and civil site work. Concrete work for 5.5 level, 580 stall cast-in-place parking garage.